All bridge events and Funbridge latest news at a glance! An update of your app has been available for a few days now. Find out more about the new features! Send messages and share your pictures with your Funbridge friends for free! 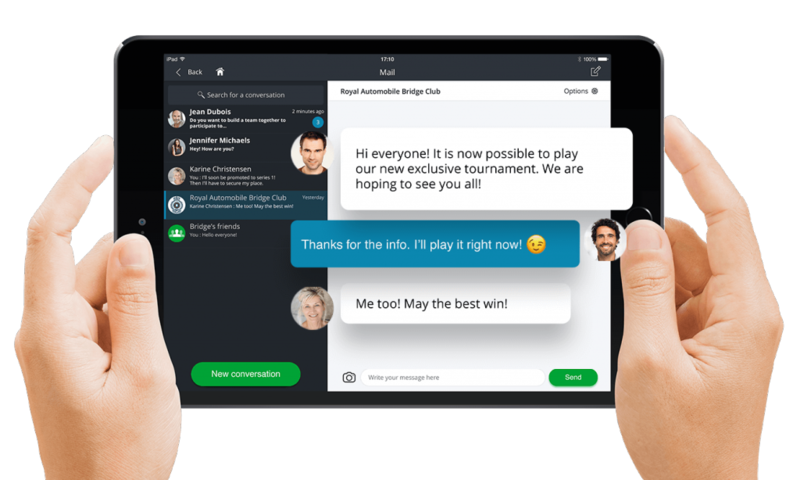 Funbridge uses the Internet connection of your phone, tablet or computer to send messages at no extra cost. Group conversations allow you to stay in touch with the people who mean the most to you: your Funbridge friends, your bridge club friends, your family and your colleagues! Group conversations are fully customisable: give a name to your group, add a picture, mute incoming messages and much more! You like switching devices to play Funbridge? As with your game activity, no matter which device you use, you will always have access to your conversations. It is now possible to adjust the brightness at the table. Go to Menu > Settings > Game table, display and ergonomics and drag the cursor to reduce or increase the brightness. Tip: Tap the < symbol in the lower-right corner of your screen to have a quick access to the app settings from the table. If you haven’t installed the updated version yet, you will be invited to do so next time you launch the app. The Royal Belgian Bridge Federation Joins Funbridge ! Mark your calendar for the new “Jack High” Swiss Pairs tournament in London on 28th December! Funbridge newsletter March 2019: get the bridge app latest news! GOTO Games is a publisher of PC, mobile and web-based applications which has specialised in the game of bridge for more than 20 years. Play whenever and wherever you like on smartphone, tablet, Mac and PC.